I caved (I bought a new car). 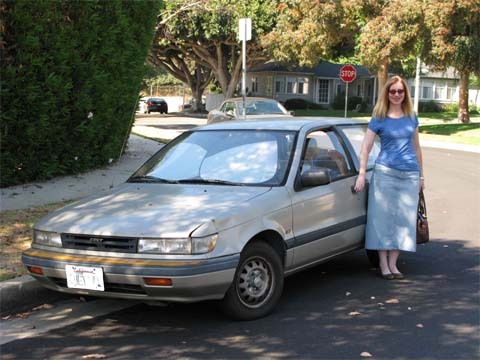 My velveteen rabbit – my ’89 Mitsubishi Colt: I traded it in. I was hoping to take it to the 20 year mark. And in this down-size decade, I was starting to feel a little competitive in keeping “down” with the Joneses. I eyed my neighbor’s old Honda thinking he would get a new car first – even though my car is still a few years older than the neighbor’s – I wanted to think they were the more indulgent, must-have shiny-and-new consumer. My old car was, somehow, my badge; my resistance to this image-conscious town and a genuine display of wanting what I have. I loved its clean, un-fussy line. One of the latest model Volvo’s looks nearly identical to my 19-year-old car. But I had already sunk some serious cash into it to maintain it and now the suspension was breaking my Colt into a spring horse and the clutch was losing conviction. I was advised that these further repairs would be costly and I was compromising my safety. 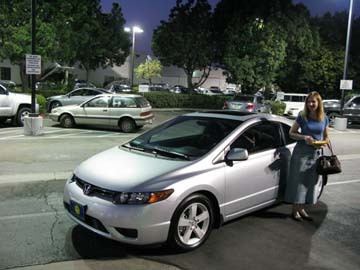 I was fixed on getting a used Honda Civic si 2003-2005 – still a hatchback; a form-factor I prefer. A dealer was asking 13.4k out the door for over 60k miles. I couldn’t do it. I eyed a used, hardtop Miata, numbers still didn’t stack up; and then I shopped for a used Mercedes C230 coupe, hatchback (gorgeous), but ultimately decided the engineering was too fussy, not as reliable as a Japanese car, and expensive to maintain. So I ramped up from there and decided to buy, reluctantly, a NEW (late year, on sale) Honda Civic. I cringed at how the Civic has become so over-sized. For preferring the utility of a hatchback, the new Civic is a form factor I don’t care for. After calling around I found the best deal on exactly what I wanted of this lesser evil and went to the dealership. I parked on the street right in front of a beautiful, used Mini. It was exquisite. It had a Baroque play of light with tonal changes grading from a black top to silver body to chrome accents. I checked in with the dealer I made an appointment with and test drove the Honda I inquired about all the while thinking about that Mini. “So how do you like it (the Civic)?, “Very nice – uh -huh – can I test drive the Mini?” He was accommodating and went and got the keys. I went over to the car and noticed it’s sunroof (yes!) and manual transmission (score!). John liked it too and my heart raced in confusion (still had a few issues with the Mini though like having to bench-press the clutch and gear shift and minimal sunroof cover; but it was a hatchback). Long story short, it was out of my budget (leather interior). So I got the Civic. And you know what? I love it! It is a larger car than what I’m accustomed to, but man is it sporty! I feel like I’m driving a GTO but I got the EX (had to get the “moon roof” and a decent sound system) so I feel like I’m driving a Lexus too. I love driving it! So I traded in my old 1989 Mitsubishi Colt. Sometimes you have to let go of the “badge” and the sentiment and discover a new form factor isn’t so bad. Is that white or metallic silver? Looks cool. Thanks for the vote of consumer confidence (…and it’s silver BTW)! I’m still lovin’ my new car. The car’s HOT! Are you sure you’re a Marxist? PS – I love Obama! I think we’re all Marxists now (per Limbaugh and his GOP cronies). Thanks for admiring my new car comrade Mike.